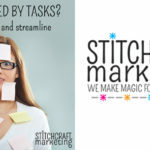 A Must-Make Project + the Perfect Yarn = Stitching Excitement! Have you ever had a project that you really wanted to make, but you had to wait for the perfect time and yarn? 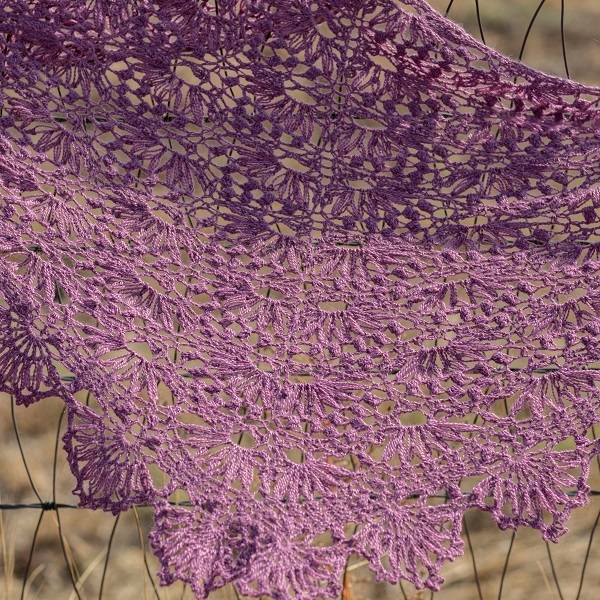 Well, that was me with the Water Lily Shawl by Lisa Naskrent. This shawl has been waiting for me to make it ever since it was published in the Interweave Crochet Spring 2016 birthday issue. Now, after almost a year in my project queue, I think it’s finally time, and I actually have the perfect yarn! This pattern calls for one hank (yes, just one) of laceweight yarn. I had to read this twice in the materials section of the pattern because I expected this shawl to need multiple hanks of expensive laceweight yarn that would break the bank. To my great surprise and pleasure, that is not the case.. So, which yarn did I choose? Well, for this project, despite the fact that the original was worked in a solid, I decided to go with one that is decidedly variegated—Interlacements Lacey in Scottish Lichen. 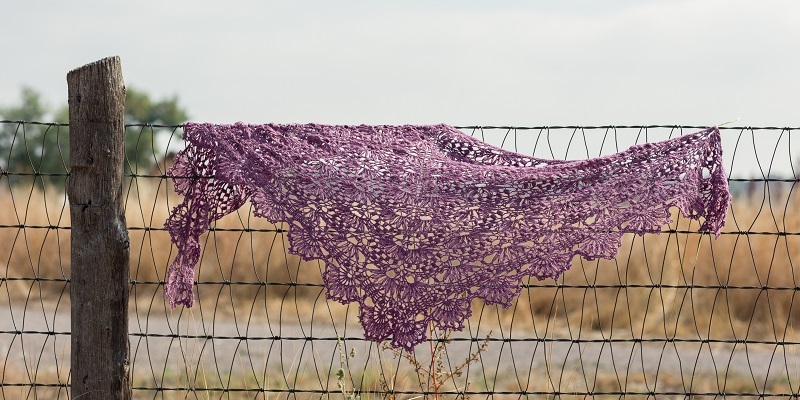 This yarn comes in a hank of 930 yards, which is more than enough to make this shawl! Another reason I’m excited for this project is that it’s my first shawl! Yes, I’ve been crocheting for several years, but for some reason, shawls really haven’t made it on my to-do list. Crazy, right? Anyway, I’m really hoping this shawl will turn out well. 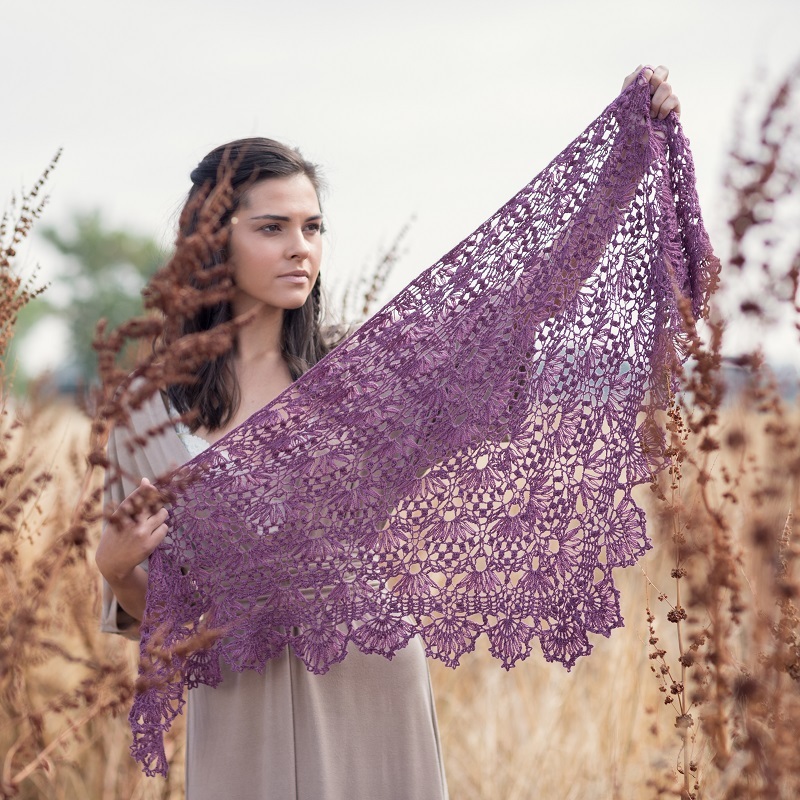 If you’re interested in taking this shawl journey with me, here are the project details. FINISHED SIZE About 60″ wide and 24″ long at center back. YARN The Fibre Co. Road to China Lace (distributed by Kelbourne Woolens) (65% baby alpaca, 15% silk, 10% camel, 10% cashmere; 656 yd [600 m]/3½ oz [100 g]; ): light amethyst, 1 hank. NOTIONS Yarn needle; 1 st marker (m). GAUGE Rows 1–8 = 2½” long and 7″ wide, unblocked. Are you a shawl maker? If so, what was your first shawl? Do you have any tips for a first-time shawl crocheter? Please let me know in the comments! Get the Full Issue or the Pattern! My first shawl was a crochet pattern that was in a magazine in the 70s. It used a variety of weights of yarn to create a draped look. I thought I had kept the pattern and have since lost track of the shawl but I loved the making of it and wearing it. It was very colorful and “hippy” looking. I make a lot of shawls now mostly prayer shawls. I get bored easily so I constantly use different patterns either crocheting or knitting. I totally understand getting bored easily. That’s part of the reason why I chose this shawl – I figured it had enough variety stitch-wise to keep me from getting bored 🙂 Are you stitching a shawl right now? If so, which one? So cool that you are making this! I saw the pictures and said to myself, hey, I think I started that pattern. I looked in my projects in progress and there it was. 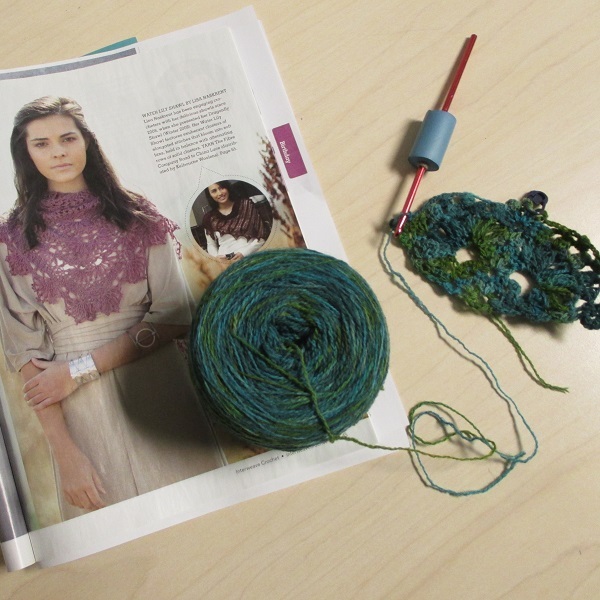 I am making it in a Madeline Tosh lace weight yarn in variegated denim blues. I’m not much farther along than your picture. We should stay in touch to compare progress. Your post inspired me to pick it back up. I’ve made so many shawls and usually give them away. Good luck with yours. Your yarn choice is gorgeous. I’m so glad my post was able to inspire you! Yes, we should definitely keep in touch to compare progress. It sounds like your yarn choice will look great as well! If you’d like to share photos or keep up with us more directly, please feel free to email crochet@interweave.com. I can’t wait to see how your shawl progresses!